They agreed on uk 9, and arrived there late but still somewhat ready for the game. After refusing to bench, they complained that the server was "laggy", because one of them had 250 ping. They wanted to switch servers, so we suggested o-n-e-clan.tk 9999. We got there and everything was perfectly pleasant, until Tiago arrived and had a ridiculous 400 ping. They then suggested ny.dyhclan 4444. We went there and were greeted by a server crash and several bouts of lag, however since their pings were insignificantly lower they were determined that they would only play here. So we started off with our pick CTF elevation. This was messy, we started off playing AR and couldn't hit anything because of the lag spikes, and it was a close game for the first three minutes. We then switched to smg and started owning, taking a major lead and keeping it the entire game. The screenshot was taken from a demo because the server crashed during the intermission (lol @ pj's). Their pick was CTF depot (as CLA?). 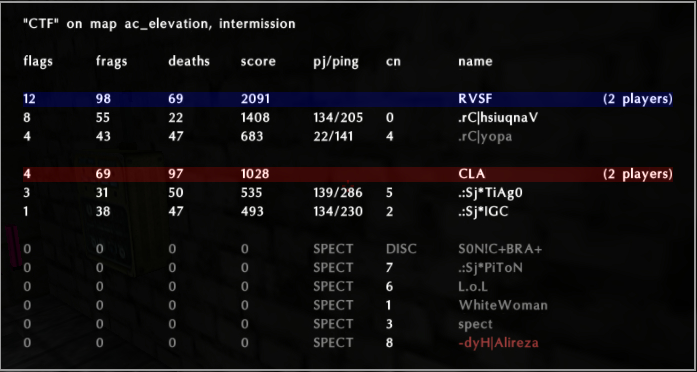 It's hard playing vs AR's who camp behind boxes when you have smg, but at least the server had stopped spiking.